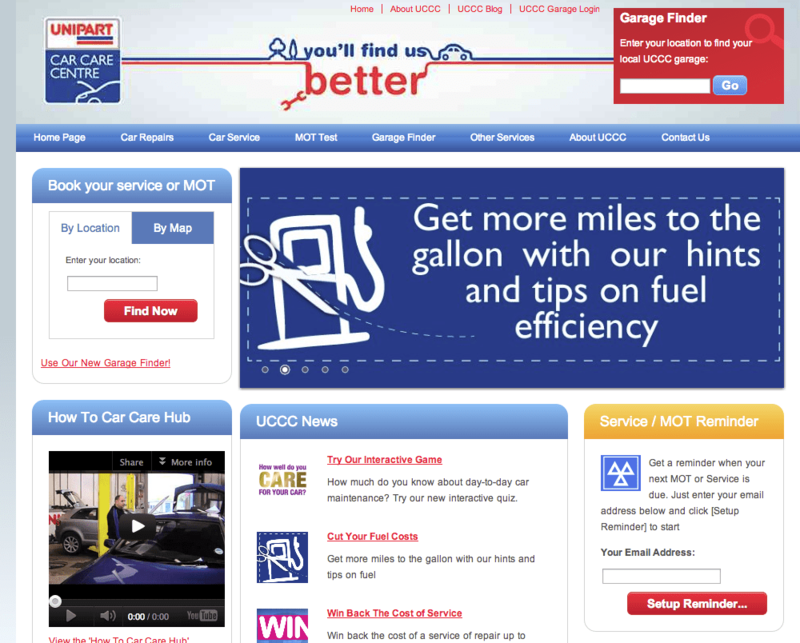 Unipart Automotive Car Care Centres (UCCC) launched its first full direct to consumer campaign in May 2012. It's part of a drive to make more use of content marketing with direct to customer communications. The campaign comprised an integrated blend of offline and online communications to drive interested prospects to its new website hub. Warm prospects were converted using personalised emails to communicate a tempting persona-based proposition. I’m sharing this example contributed by Expert member Stuart Sykes, who I interviewed in preparing a case study. Many thanks to Stuart for sharing his approach and experiences. Expert members can read the full 10 page case study which explains the whole campaign end-to-end from research, objective-setting, content plan to execution, results and learnings. It’s part of our marketing case studies ebook. In this post, I’ll summarise the main points from the campaign. UCCC garages have a clear USP. All customers receive ‘The Nationwide Guarantee’ which assures them if any part fails within 12,000 miles or 12 months (whichever is soonest), the customer can take their car to any of the 700+ Car Care garages in the UK and get the replacement work done free of charge. This core message is communicated through the “You’ll find us better” strapline and panels across the site substantiated by a 98% customer satisfaction rating visual. The main elements of UCCC’s three-pronged research approach are shown here. TGI data was used to map all UCCC’s potential target consumers, and four large and desirable target segments were identified. Tracking social media conversations and feedback from garage owners and customer service were key insights sources. In 2011, UCCC organised brand research to identify core ‘truths’ about the brand and establish UCCC’s current brand status in the eyes of its consumer target market. UCCC was interested in consumer brand perceptions in relation to its competitors and the consumers’ own needs. The research also encompassed a detailed examination of customer needs and priorities to ensure the brand proposition and communications were as relevant as possible. The in-depth case describes the SMART objectives used for visitor numbers and engagement. Personas were created using a range of digital modelling techniques, combining such data as applied gender, age, needs and requirements, car knowledge level, etc. to create personas such as ‘bargain hunters’ and ‘explorers’. The personas were used to determine content assets, engagement devices and drive a personalised one-to-one communication strategy to convert and build relationships with new customers on an ongoing basis. The campaign included online and offline ads to reach the target audience. The May campaign’s digital communications included two new online adverts, targeting male and female car owners separately. 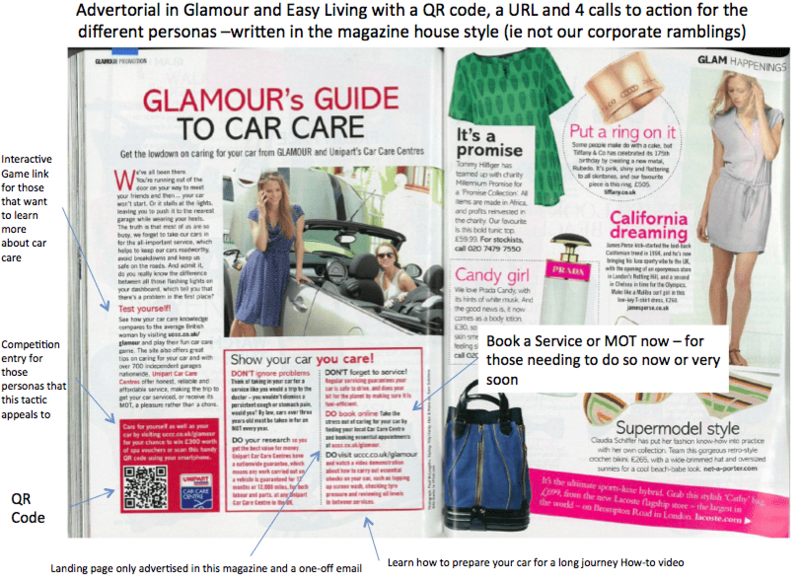 Advertorials appeared in Glamour and Easy Living magazines. “The key learning was the integration of online and offline experiences - matching consumer experiences across contact points - not just driving traffic to home page but to relevant online content, such as specially developed landing pages, to reduce bounce rates". With most consumers not likely to need a service straightaway a range of engagement tools such how-to videos and prize draws were developed to create initial engagement. Specific landing pages were created to be consistent with the traffic sources such as Glamour and Easy Living magazines. Once consumers had indicated their interest in UCCC, for example, by visiting the website or clicking on a link form a trusted source, such as moneysavingexpert.com, Glamour magazine and Easy Living magazine, a third-party endorsed personalised email was despatched. The first email communicated a tailored persona-based proposition to encourage subscription to UCCC emails. 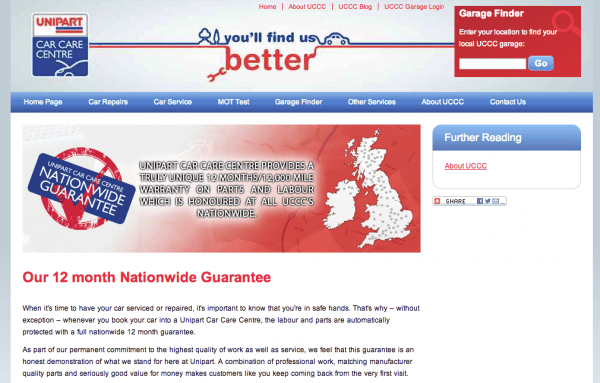 Once a consumer subscribed, they received follow-up emails containing timely reminders about the consumer’s car MOT and service dates and calls to action, such as “your MOT is now due, click here to find your nearest 5 Unipart Car Care Centres”. More competitions targeting different audiences and segments. Further links to, and exploitation of, social media. In connection with competitions, social media will be further integrated with other channels, including the website, to help extend competition shelf-life. A mobile version of the website. Future plans also include the creation of a CRM database. Certain data fields to support future eCRM solutions are already populated thanks to the campaign, ongoing digital communications and new functionality, like a connection between UCCC and an external email supplier.